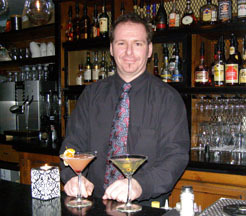 L'Avalanche Restaurant - Bistro Lounge in Mont-Tremblant, Canada features French bistro cuisine, a creative martini menu, and the talents of Chef Alexandre Gaudette. 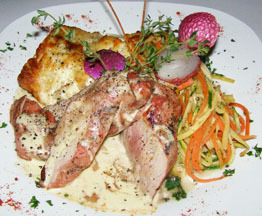 Located in a historic house in the Pedestrian Village, the restaurant is both charming and welcoming. In 1939, Developer Joseph "Joe" Ryan had a dream to make Mont-Tremblant a first class resort, and indeed has succeeded. 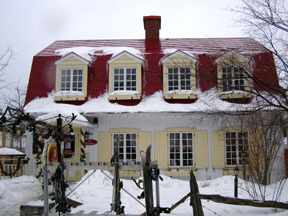 In fact, L'Avalanche Restaurant - Bistro Lounge is located in his former guesthouse, now painted yellow with white trim and a bright red roof. Inside, the ambience has a decidedly French feel to it; floor to ceiling red print on linen fabric graces the windows and the upholstered banquette; black chandeliers, fairy lights, and votive candles on the white linen dressed tables softly illuminate the room; old black and white photographs in black frames add charm to the blue walls with dark wood wainscoting; and a well-stocked bar completes the ambience. Edward and I had dinner at the restaurant in mid-February 2009 and were impressed with the young talent in the kitchen, Executive Chef Alexandre Gaudette and his passionate team consisting of Jovin Degre and Claude Guerette. The restaurant features 25 interesting martinis on their cocktail menu, so we had to indulge in a pre-dinner cocktail of a Dirty Martini (Gin, Olive Juice, Dry Vermouth), and a Peche Mignon (Peach Schnapps, Vodka, Orange Juice, Pineapple, Soda, Grenadine) to enjoy while we perused the menu, which features a wide selection of tapas as well as à la carte options. At the suggestion of our server, Alain, we began with two tapas of Les Feuillettés - Puff Pastry with baked brie, caramelized onion, grilled pears, drizzled with raspberry vinegar reduction sauce and garnished with a Cape Gooseberry, also known as physalis; and Puff Pasty with tomato, mozzarella, prosciutto, and garnished with thin julienne beets, basil leaf, chopped herbs, and a Cape Gooseberry. Edward continued with a main course from the à la carte menu of Filet de Porc avec sauce moutarde et vin blanc. The course was attractively presented on a square white plate with generous slices of pork filet with a mustard and white wine sauce, topped with an apple reduction, accompanied with a mélange of julienne parsnips, carrots, and zucchini, potatoes au gratin, garnished with a fresh lychee, and paired with a glass of Chilean Cabernet Sauvignon. 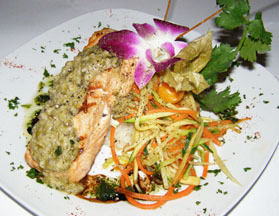 I had the Filet de Saumon Grillé, presented on a square white plate with grilled salmon topped with lemon and pesto caper sauce, accompanied with goat cheese and fresh basil risotto, a mélange of julienne vegetables, and garnished with an orchid blossom. Paired with a glass of Chardonnay and hot olive rolls still steaming from the oven, this was a wonderful and hearty course. For dessert, we shared the Crème Brûlée Duo, a delicious combination of a pot of green tea, honey, and vanilla crème brûlée garnished with a fresh strawberry; and a pot of Bailey's and coffee crème brûlée garnished with a fresh bing cherry, and finished the relaxing evening with a glass of port, while chatting at the bar and making new friends. L'Avalanche Restaurant - Bistro Lounge is open daily for dinner as well as for lunch during high season in the winter and summer months. 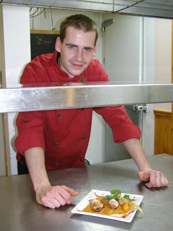 Read about L'Avalanche Restaurant - Bistro Lounge in the Chefs' Recipes section where Chef Alexandre Gaudette shares a delicious taste of the restaurant.